The 1600mm Left-hand version in Royal Oak. The Deskits Range is a flat packed selection of twin upright cantilever end frame desks, built for strength and stability. All Deskits desks have 25mm tops finished with 3mm high impact resistant polypropylene edging. Models feature cable ports. Cable Trays are available as optional extras. This desk is available in Royal Oak or Beech finish with Grey metalwork and can be used with under desk or desk high pedestals. 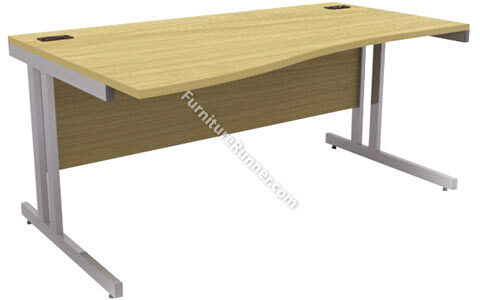 These desks have been designed and manufactured to conform to: BS EN 527-1:2000 - Office furniture, work tables and desk dimensions. BS EN 527-2:2002 - Test methods for the determination of stability. BS EN 527-3:2003 - Test methods for the determination of strength. BS 3044:1990 - Ergonomics principles in the design and selection of office furniture. BS EN ISO 9241 - Ergonomic requirements for office work with visual display terminals.